BEIRUT: Firas Wazneh was tired of waiting for news of clashes to hit the television and social media when he could hear them outside his window. 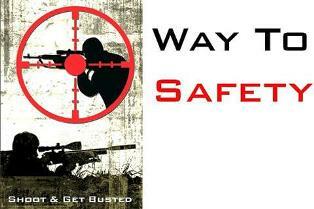 Thus, the idea for Way to Safety was born, a mobile application that would identify the location of shooting as well as the type of weapon within 30 seconds. “For an hour or so I was searching TV, social media, everything and I couldn’t find anything,” he said. Of course, bringing the project from theory to application has been difficult, and after working on it for almost a year, Wazneh estimates it will be another two years until his app is ready to be mass downloaded. If and when it is, Way to Safety will join a growing market of security-minded apps born out of the instability that is a constant of life in Lebanon. Ma2too3a, which came out last year, uses crowd sourcing to identify unrest, blocked roads and accidents. This past summer, the Lebanese Army released its own app allowing users to report security incidents, suspicious activity or wanted criminals. Despite the hype, though, the app still appears half finished, and as of this article the list of wanted individuals was empty. Wazneh hopes to use technology already at work in high-crime areas of the United States, where authorities have installed microphones connected to servers that can identify the source of fire within seconds. In Lebanon, however, setting up expensive fixed infrastructure that requires security clearance is all but impossible. Way to Safety would rely instead on crowd sourcing, picking up background noise from subscribers which would be carried back to a central server for analysis. “I don’t need high quality microphones because of the quantity,” Wazneh explained. Not everyone is comfortable with the idea of downloading an app that is constantly recording, in addition to considerations of bandwidth and battery power. These are just a few of the obstacles Wazneh will have to overcome before his app can have the kind of impact he hopes for. One solution is to schedule the app to run intermittently, effectively jumping from user to user to create a map of where clashes could be happening. “There are concerns about privacy, but the only way I can solve that is to certify [by a third party] that I am not listening,” Wazneh said. While Wazneh has received support from Saint Joseph University professor Marc Ibrahim, who volunteered several students to work on the project, and the local techie community, the government has been less accommodating. So far, Wazneh’s requests to the Defense Ministry to create a sound database of different kinds of weapons discharging have not met with success. “I’ll just have to test it with a different kind of sound,” he said.